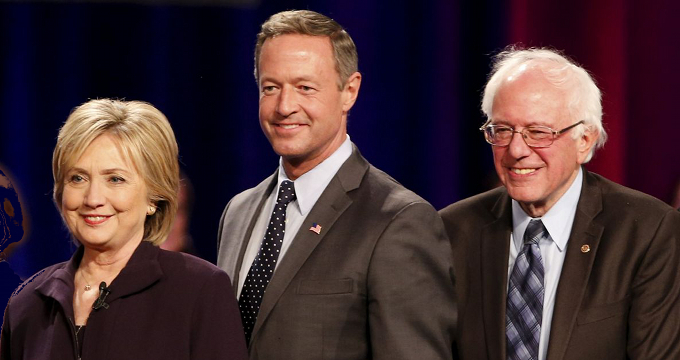 Hillary Clinton, Martin O’Malley and Bernie Sanders in South Carolina. There are three candidates left in the race and we can get into arguments aboout whether “really” there are only two or there is only one, but the first votes won’t be cast for months and then other dynamics will set in. In South Carolina a little more than half of the Democrats are African-American and one poll taken a week before the forum showed Hillary Clinton with about a four to one advantage over Bernie Sanders in that sector. If Sanders can break off at least a quarter of Clinton’s black support and have those voters cross over to him, or if he can be the beneficiary of an extraordinary turnout by younger black voters, he will have a chance to win the South Carolina primary. If Clinton can maintain her lead, she will be hard to beat.